"A certain critic - for such men, I regret to say, do exist - made the nasty remark about my latest novel that it contained 'all the old Wodehouse characters under different names'. He has probably by now been eaten by bears, like the children who made mock of the prophet Elisha: but if he still survives he will not be able to make a similar charge against Summer Lightning . With my superior intelligence, I have outgeneralled the man this time by putting in all the old Wodehouse characters under the same names. Pretty silly it will make him feel, I rather fancy." In this particular novel, Wodehouse takes his readers back to Blandings Castle to visit with various old friends. (I am pretty certain that this is the first time I've visited Blandings Castle myself. However, I cannot be too sure because, to be honest, I have a hard time remembering sometimes which Wodehouse books I've read and which I haven't.) I rather side with the critic mentioned above in part by saying that Wodehouse recycles characters and traits and just renames them. When people ask me for my suggestion of a good Wodehouse title to start with, I simply feel forced to say: "Choose any! They are all good!" And that they are. (I'm never bored, no matter the title.) Although Wodehouse's humor is "trademark" in that it runs the same throughout all of his books, I have to think that a reader well-versed in Wodehouse can likely distinguish between his characters very well. I'm versed in Wodehouse, but I wouldn't say I'm well-versed. Anything in the nature of misunderstanding was cleared away. It was both of them. Then again, it's not just the dialogue which I love but the way that Wodehouse sets up scenarios and then seems to mock them as he goes about his story telling business. That just cracks me up, that's what! Wodehouse is a must read because one really needs to relax and laugh with a good book from time to time. We can't be all about historical tomes and Hard Times with Dickens and fluffy diaries of wimpy nothingness. We must learn to lighten up and snicker a bit without feeling like the literature that has made us laugh is mind numbing filler. Wodehouse may seem a lighthearted affair, but it's serious hilarity and I think it important to distinguish him as an author worth reading. 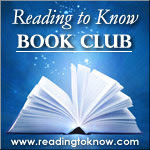 If you're reading along with the Reading to Know online book club this month, take note of the fact that we'll be posting our wrap-up post this Friday, April 27th. 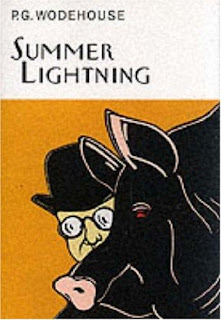 I hope you've taken some time to get to know Wodehouse if you were previously unfamiliar with him! Friday! I thought we had til Monday. I'd better get cracking. I just started Psmith in the City and it's just starting to get interesting -- the first chapter or so was kind of slow for me. I agree, every now and then something light just fits the bill. He does recycle his characters, but so what!? It's always funny. ALL of your quotes made me laugh. Every. Single. One. So, once again, I won't read him this month, but WILL read him. Someday soon. What? NO Wodehouse in the entire library? What is this country coming too? Carrie, that introduction quote was hilarious! I also must comment that Rupert Baxter is one of those characters one just loves to see suffer. Schadenfreude is so delicious. That quote is a great taste of how Wodehouse writes! (happy sigh) Thank you for such a jolly good book club dearie!